My parents are in town, which is amazing in a lot of ways, including the fact that they love changing diapers and my mom refuses to let anyone help her with the dishes. In fact, she’s doing the dishes right now and made me promise to mention her. Hi Mom! Anyway, I’ve been thinking about daily routines, especially as I figure out my new one. I used to exercise first thing but now my mornings are spent drinking coffee and pumping while Rob gives Lilly “Music Education” class. It’s as weird and wonderful as it sounds. 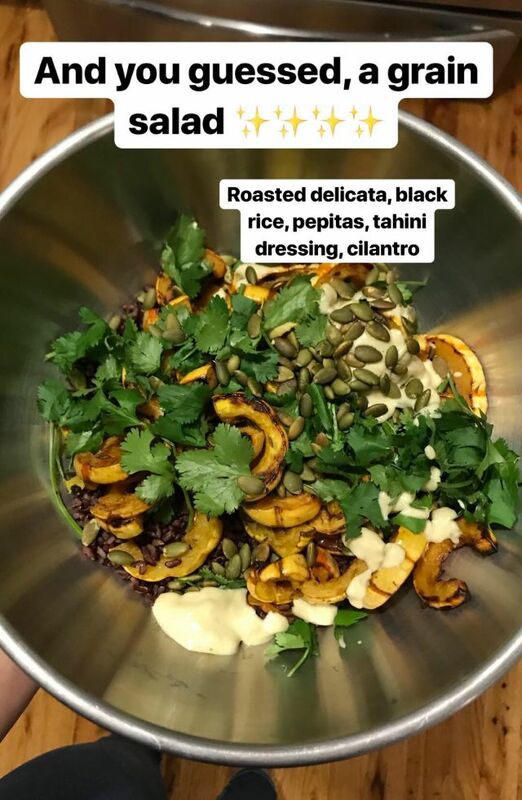 And at night, instead of letting dinner come together organically, we have to strategize and prep to get Lilly in bed by seven and have a homecooked meal. Workouts remain a moving target but we’re actually cooking more than ever, and hope to keep at it even as our lives get more complicated. Here are some of our strategies for everyday healthy cooking, plus a couple other fun things on my radar. If you’re a regular here, some of these tips might be familiar; if you’re new, welcome! Old newsletters live here. I know I’m not normal. I think about food more than anyone I know. But I’m also realistic about how much space other people allow food to take up in their brains, which is why these strategies don’t require you to, say, spend an hour ruminating on the platonic ideal of granola. Know your staples: A few newsletters ago, I included a doc with our go-to pantry items as well as the recipes we keep in heavy rotation. You don’t have to create a Google Doc but it’s super helpful to think about the ingredients you should buy on autopilot or set up as recurring on FreshDirect to ensure that you never open the fridge to find only condiments and Champagne (looking at you, Annie Chen). Sunday prep day: The best way to set yourself up for a week of delicious food is to carve out time on the weekend to shop and prep your building blocks for the week. By building blocks, I mean things you can mix and match to make a variety of dishes: big batches of beans, grains, roasted vegetables, salad dressing etc. Here’s a great grain salad blueprint. It’s also a great time to make freezer-friendly things like soup, stock, and meatballs that will come in handy down the line. Finally, you also can’t go wrong with a roast chicken (or tofu, if you’re veggie), which makes for a perfect Sunday supper and later-in-the-week salads. Toppers and shortcuts: The downside of cooking in bulk is mid-week fatigue, which is why you need to have two things in your arsenal: jazzy extras and go-to sauces. By jazzy extras, I mean flavorful or crunchy things that liven up that salad or rice bowl: nuts, avocado, cheese, crumbled nori, whatever works for you. On the sauce side, I’m a fan of tahini on anything, but even that can get old. I recently tried Haven’s Kitchen’s new saucesand was super impressed—they’re made from all real ingredients and are extremely versatile. I tossed leftover rye berries and kale with the chimichurri, used the kale pesto to jazz up scrambled eggs, and paired the romesco with roasted cauliflower. They’re the type of thing I used to make from scratch but with seven months of parenting under my belt I’m realizing shortcuts are the key to success. If you’re in New York, they’re available at Haven’s Kitchen and Whole Foods, and also via FreshDirect. On cookbooks: I love cookbooks but the goal is to find things you’ll want to make again and again, and can adapt to your tastes/what’s in your fridge. Ideally you’ll develop a stable of go-to dishes, and the recipe ends up something you consult for temperature or cooking times rather than step-by-step guidance. Lately, I’ve been giving my new parent friends Jenny Rosenstrach’s wonderfully approachable and pragmatic cookbooks, Dinner: A Love Story and Dinner: The Playbook. They’re great even if you don’t have kids because the recipes are all fairly simple, quick, and tasty. Getting in the spirit: I can’t be the only one who forgot the Winter Olympics start this week. Quick fix: Read this past weekend’s New York Times Magazine, which takes an offbeat literary approach to the Games. There’s Karl Ove Knausgaard on the attraction of speedskating, a fascinating piece on Indian luge pilot Shiva Keshavan, and a stomach-turning story that explains why big-air snowboarding is actually insane. Leaning in to mom jeans: I recently picked up these high-rise Everlane jeans and they’re a welcome change from my usual skinny ones (AYR are my favorites if you’re wondering). They’re a little stiff, a little straight legged, and a tiny bit 90’s—I’m hoping I can pull them off because I’ve been wearing them nonstop. By request: Tips on transitioning babies to solid foods. We’ve been giving Lilly tastes since four months but she didn’t start eating real “meals” until six or seven months. We’re doing a combination of baby-led weaning—a fancy way of saying give them whatever you’re eating—and spoon-feeding. 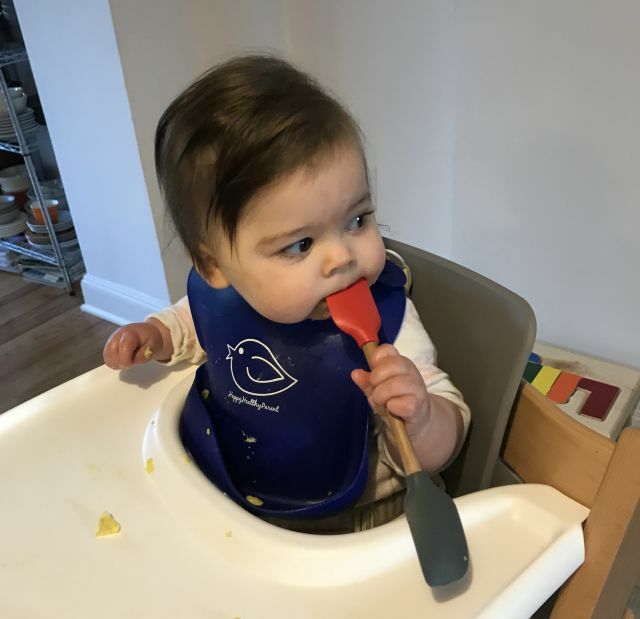 The way I think about it is: baby-led weaning is for motor skills and learning to enjoy food, while the spoon-feeding ensures they actually consume food (and don’t just spread it all over the floor, themselves etc.). Lilly wasn’t into purees so we switched pretty quickly to spoon-feeding her regular food like steamed Raised Real meals, roasted vegetables, oatmeal, and scrambled eggs. I also give her bits of “regular” food that she can pick up and chew on; so far she’s loved chicken bones, crusts of bread, pieces of meat, banana-egg pancakes, apple slices… I just keep an eye to make sure she doesn’t bite off more than she can literally chew. And lastly, nuts! We broke the seal recently with Trader Joe’s Mixed Nut Butter, which was exciting and messy. So far so good, and we’re going to introduce Bamba snacks too, either the classic version or Trader Joe’s new ones. I shortened a spatula and whittled a matching end with a knife to accept the silicone head from another spatula. It needs to be fairly snug so the child doesn’t pull it off. It’s pretty quick if you use a chop saw to cut the spatula shaft and a drill press or lathe to score a ring on the shaft at which to start the taper for the new spatula head. Contrasting colors seemed like a good idea. The end. Happy cooking and send me *your* weeknight dinner tricks and favorite dishes!